This is Vivian and Lloyd Mann. The picture, according to the photographer’s stamp on the frame, is from McGregor, Texas. Luckily with two names and a location the children were easy to find in the 1910 and 1920 census. 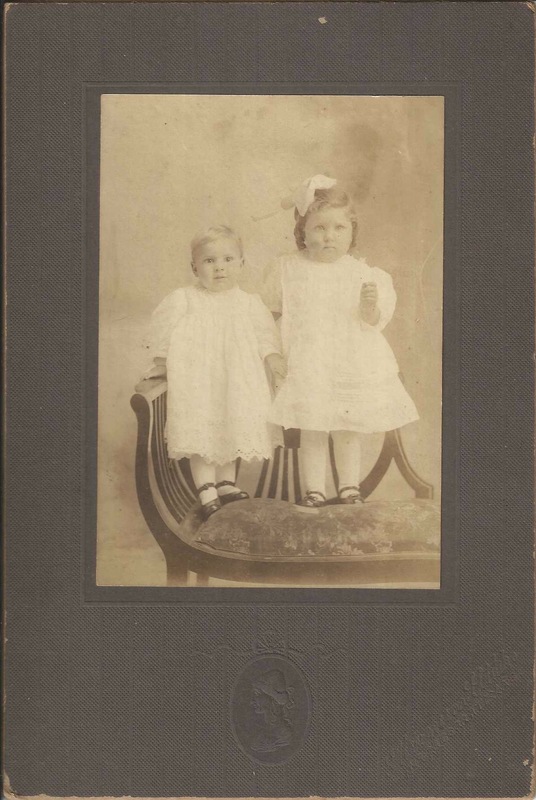 Vivian is the first child born to John Mann around 1908. She and her little brother Lloyd, who’s only 1 year younger, were both born in Texas. This picture was probably taken around 1911 or 1912 considering how young they are. In the 1910 census a 22 year old John, his brothers and sisters, along with Vivian and Lloyd (babies) are living with John’s parents, Vivian and Lloyd’s grandparents. John is listed as a widow. By 1920 John appears to have remarried, to Myrtle, and has a 3rd child with the new wife, a Jennie Myrtle Mann. I’m curious what happened to Vivian and Lloyd’s mother. Vivian is my grandmother, and her mother did in fact pass away at a very young age. Her sister was Johnye Myrtle Mann. I am obviously curious where you found the picture and what the circumstances where in how you obtained it. Hi John, I’m so glad you know the people! I found this picture in an antique store in Houston where I buy many old pictures for the purpose of posting here in hopes of reconnecting it with a family member. I know only what I listed here. Feel free to save the photo digitally from this site if you’d like. If want the physical copy of the picture send me an email and we can arrange. jodibash@gmail.com. Its really more than knowing them, my grandmother’s mother was buried at Commanche Springs, a small cemetery outside of McGregor. There were a couple of really good photographers in McGregor at the time one of whom was Gildersleeve. I went out there several years ago, and that was when I discovered that her mother had died so young. The most curious thing about this is the fact the picture ended up in Houston, where I have a cousin, as well as a sister neither of whom would have likely ever released the picture. I guess I should ask if there were more that were a part of that collection? There were not other that I could tell. It’s a large antique store that rents out space to many different dealers. the ones with photographs usually have them all in a big box together priced by size. I didn’t see any in this box of other Mann’s or with names written on the back in similar handwriting that might indicate they were of a group. I always to wonder how pictures get where they are! Lloyd Mann, the boy in the photo is my Grandfather. He married Johnnie “Jackie” Williams and they had one daughter, Linda who is my mother. Sadly, Lloyd died on April 15, 1947 when my mom, Linda was barely 8 weeks old. To this day, I have only ever seen two pictures of my grandfather, and both were as an adult. He looks so much like my brother as a baby and my own son as a baby! Thank you so much for buying this and posting it! I would love to see if I could have a physical copy of the photo to give my mom. She knows almost nothing of her father. She remembers meeting her aunt Vivian or Jennie a few times as a child, but her mother remarried and her step father moved the family to California. It would seem that John Gardener and I are cousins of sorts! John, please contact me at smithkatie916@gmail.com if you have information on the family. I’m trying to piece together what I can for my mom as her mother, Lloyd’s widow Jackie, would never talk about him. She was just too heartbroken. I can’t begin to thank you enough Jodi! Katie, I am just so glad you found this photo! I’m happy to send it on to you. I’ll contact you via email to get your address. I hope you and Mr. Gardner can compare notes as well – it may help the family search.